Owning antiques can be a wonderful way to add a bit of history to your home décor. Many individuals are absolutely obsessed with antique shopping because it is fun, educational and quite interesting. You can find a variety of different objects like furniture, dishes, artwork, and even old tools and gadgets that can make for an interesting conversation piece in your home. Some consumers try to collect items that remind them of their own childhood or items that were owned by family members. Other consumers have extensive collections of one type of antique item such as antique clocks or antique keys. This is an excellent hobby that can provide you with a sense of history. 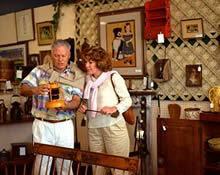 Antique shopping is also great exercise for older individuals. When you shop for antiques, you may walk several thousand steps in a single day. You will also find yourself bending and reaching for items which can increase the heart rate and help you to stay fit. There are a variety of reasons why antique shopping can be so enjoyable, and yet many consumers are intimidated by antique shops for one reason or the other. Large antique shops may seem overwhelming, and some consumers hesitate to purchase antiques because they don't know whether or not they are making a valuable purchase or wasting money. It is easy, however, to find informative articles and blog posts that will teach you all about antique shops. This way, you can begin a new hobby with confidence. The most important thing at any antique shop is that the shop owners keep a wide variety of different antique items in order to suit different customers' needs and preferences. Not all antique shoppers are interested in large furniture pieces and expensive art work just as not all antique shoppers are interested in knick knacks or inexpensive novelties. With a wide collection of antiques, shop owners can provide something for everybody. 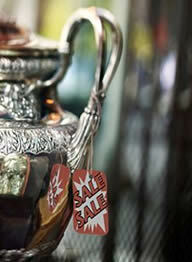 Antique shops should also regularly receive new inventory and eliminate items which are not selling very rapidly. This will ensure that there are new treasures to behold every time you visit the antique shop. Another thing to inquire about when antique shopping is the process by which antique shops repair, restore and care for their antiques. Some antique shops may not complete any restoration process on their antiques whatsoever. Consumers should take this into account because they will have to pay somebody to restore the antique so that it can be proudly displayed in a home or office. Antique shops that do have restoration procedures may charge more for restored items. However, shoppers should carefully inquire about the restoration process and the credentials of the individual who performed the restoration. Someone who has no professional knowledge about restoration can easily destroy an antique or severely diminish the value. Some antique shops are booth rental shops or commission antique shops. This means that many different individuals store their personal antiques at the shop. When a consumer purchases a specific antique, the sale is noted and the shop and the owner split the profits from the sale. There are pros and cons to this type of antique shop. First, the items at these shops are often much more reasonably priced than privately owned antique shops. However, the buyer may not be able to secure any information about the seller or the piece itself. Many antique shoppers like to know the history of an item before they buy it, and commission or booth rental antique shops are staffed by employees who most likely know very little about individual items. Many antique shoppers stress out unnecessarily about whether or not to purchase a specific item. The truth is, you shouldn't always worry about the value of an item. Items do not need to have monetary value in order to be valuable to the owner. Some consumers simply fall in love with a specific antique and want to add it to their homes and their lives because it communicates something wonderful to them. This is the attitude to have when you decide to go antique shopping.